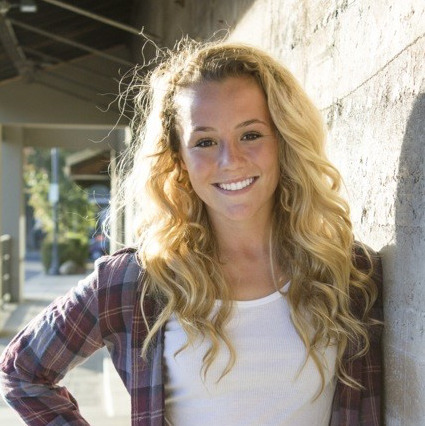 Mary Beth is a senior soccer player at Saint Mary’s High School in Medford and has volunteered on a regular basis since the sixth grade at the TOP Soccer Outreach program. TOP provides adaptive physical education to children who may not qualify for organized sports or club activities due to behavioral or physical limitations. TOP connects kids in small groups of two to three people, with a coach who leads exercise and game activities to facilitate teamwork, social interaction and physical activity. Mary Beth coordinates the coaches for the program, assigns kids to coaches and acts as a coach herself, while also participating in program design. Dave Potter, the program director in Medford, says that Mary Beth is the single most important volunteer. Parkes is a junior soccer player at the University of Portland and volunteers regularly with the Immigrant Refugee Community Organization (IRCO) and Portland Parks & Recreation. Last summer Parkes volunteered for IRCO as a summer school literacy teacher for immigrant and refugee students--in the morning she taught students English grammar and vocabulary, and in the afternoon she lead recreational soccer. One of her most important responsibilities during this activity was to foster a welcoming environment for all cultures and backgrounds, making sure that the students were good teammates to everyone, regardless of another person’s country of origin or English proficiency. Parkes also volunteered with Portland Parks & Recreation for the annual Portland World Cup for immigrants and refugees. She played a behind-the-scenes role helping organize rosters, order equipment and set up the event. Parkes hopes to organize and coach a team of Nepali and Burmese girls for next summer’s tournament. Kids Riding Bikes engages youth by combining a part of every student’s life – technology – with a physical activity that is appropriate for all skill levels. Single speed bicycles are placed on a computerized trainer that report distance, speed and power on a large screen. This gamification provides instant, real-time feedback. During the four-week course students are able to track their progress and growth. Provides the program at no cost to students.